O/o Deputy Commissioner, Tinsukia . 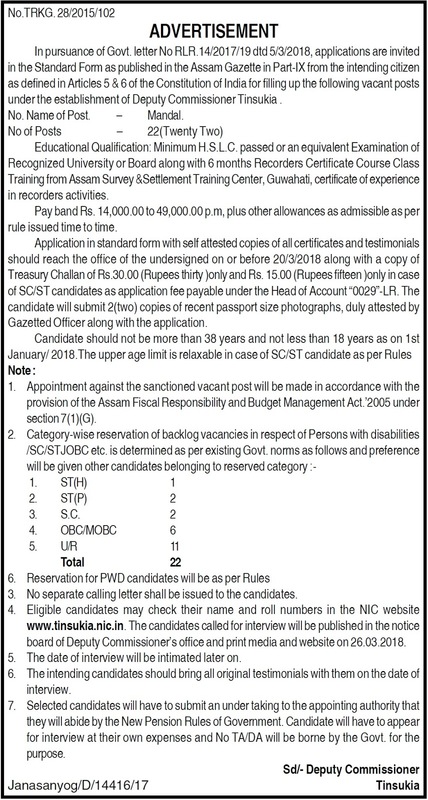 Applications are invited in the Standard Form as published in the Assam Gazette in Part-IX from the intending citizen as defined in Articles 5 & 6 of the Constitution of India for filling up the following vacant posts under the establishment of Deputy Commissioner, Tinsukia . How to apply: Application in standard form with self attested copies of all certificates and testimonials should reach the office of the undersigned on or before 20/3/2018 along with a copy of Treasury Challan of Rs.30.00 (Rupees thirty )only and Rs. 15.00 (Rupees fifteen )only in case of SC/ST candidates as application fee payable under the Head of Account “0029”-LR. The candidate will submit 2(two) copies of recent passport size photographs, duly attested by Gazetted Officer along with the application. No separate calling letter shall be issued to the candidates. Eligible candidates may check their name and roll numbers in the NIC website www.tinsukia.nic.in. The candidates called for interview will be published in the notice board of Deputy Commissioner’s office and print media and website on 26.03.2018. The date of interview will be intimated later on. The intending candidates should bring all original testimonials with them on the date of interview.